Counting down the days to summer? While it might not be quite warm enough to spend much time out on the patio just yet, it is time to start getting your patio ready for the season ahead. If you’re building a whole new patio this year, check out our tips for planning the perfect patio. But if you’re planning to keep the patio you already have, here are some ways you can start preparing your patio for the warmer months ahead. 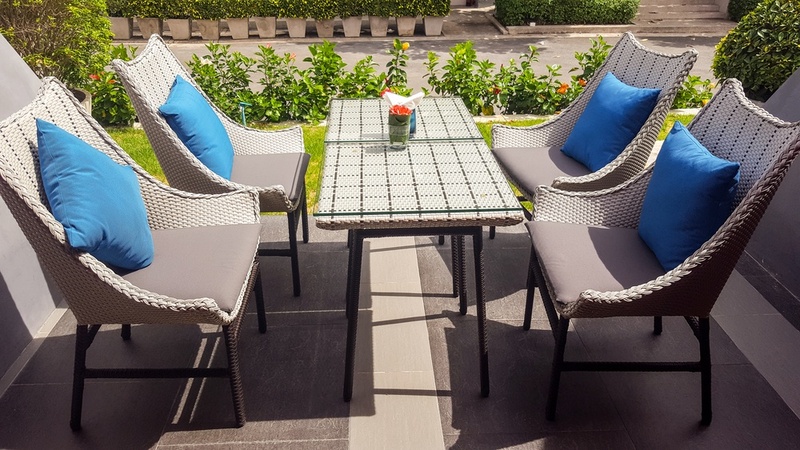 The first step to getting your patio ready for spring is to get rid of all the dirt that’s accumulated on your patio tiles and furniture from last year. It goes without saying that the things you keep on your patio can collect a lot of dirt, so now is the perfect time to give them a thorough cleaning. If your patio stones or tiles are a looking a bit dingy, rent a power washer from your local hardware store to get them looking good as new. Power washers can also be used to clean some types of patio furniture, but depending on what material your furniture is made out of, you may need to take a gentler approach. Why go inside when the sun goes down? If you want to spend time on your patio during the evening, look for some ways to add exterior lighting around your patio. Strings of lights add a subtle but very memorable look. Many nurseries and other garden supply stores sell small, solar-powered lights which can be placed on the lawn or in the garden surrounding your patio. Exterior lighting can be a lot of fun to experiment with, so explore your options. Patio furniture and tiles get a lot of exposure to the elements, which can really take a toll. Fabric cushions can become faded and get torn over time. Patio stones get cracked and broken. Frames of patio furniture can become damaged or start to rust. If some of the things on your patio have seen better days, repair them if possible or replace them with new ones for a completely fresh start. Now that your patio has been cleaned up and your furniture is ready to go, it’s time to accessorize and really make it your own. There are so many ways you can go about this. Outdoor rugs come in many very eye-catching styles and can make your patio feel like an outdoor living room. Throw pillows for your patio chairs could add a pop of color or bring a bold pattern to your patio’s decor. Want to create some privacy for your patio? Consider putting up outdoor curtains or shades. Of course, planters full of beautiful flowers and other plants always make a great addition to patios. If you spend a lot of time outside during the spring and summer, maybe a little extra storage space would be nice to have. Getting storage bins for your patio is a great way to keep toys, extra cushions for furniture, blankets, and so much more out of sight. They’ll be easy to grab anytime you need them, but it will be easy to keep your patio looking organized all summer long.